The cryptomonads ("hidden flagellates") are primarily biflagellate unicells 3 – 50 µm in length, asymmetric and flattened, often with a visible food groove offset near the apical end. Most contain one, two, or many discoid chloroplasts, others have none at all (e.g. heterotrophic Chilomonas). They are heterokonts (two differing flagella) with one longer flagellum bearing long mastigonemes (each with a single terminal hair), and one shorter flagellum bearing shorter mastigonemes (each with two terminal hairs). Rosette scales line the flagella. Mastigonemes and scales are not visible in a light microscope. Several genera are photosynthetic, potentially also phagotrophs thus mixotrophs, and several others are colorless osmotrophs. Similar to many other classes of protists, the cryptomonads also have a non-flagellated ‘palmelloid’ stage in which they become more rounded. 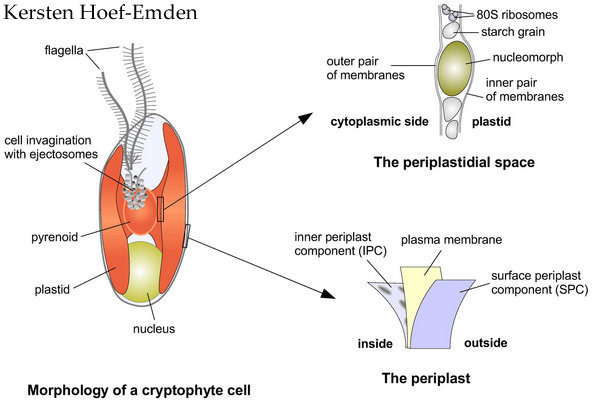 The origin of photosynthesis in cryptomonads is thought to be through phagocytosis of a unicellular red (rhodophycean) protist, or a pre-red organism. The chloroplast is surrounded by four membranes, and is thought to be a symbiontic eukaryotic cell inside the host cell (McFadden et al. 1994). It also contains a 'nucleomorph' considered to be the remnant nucleus of the endosymbiont, with gene sequences divertent from those of the host nucleus. Containing phycobilin pigments typical of cyanobacteria and rhodophyceae, the endobiont was thought to be a rhodophycean or pre-rhodophycean protist (Douglas et al. 1991, Cavalier-Smith 1992). Plastid-containing photosynthetic or mixotrophic cryptophycean genera were limited to only four – Hemiselmis, Chroomonas (a.k.a. Komma), Cryptomonas and Pyrenomonas nom. nov. (Santore 1984) – but more recently also include Falcomonas daucoides, Geminigera (a.k.a. Plagioselmis or Teleaulax), Goniomonas, Guillardia theta (a.k.a. Hanusia phi), Proteomonas sulcata, and Rhodomonas (a.k.a. Rhinomonas or Storeatula) (Hoef-Emden and Archibald 2010). Ultrastructural anatomical features as well as more recent molecular analyses have required revisions in the phylogenetic relations of these protists (Santore 1984). Proteinaceous plate-like scales lining the inside (and sometimes also the outside) of the cell membrane form a protective periplast. Often rosette scales also occur to the outside of the cell membrane. In addition the cell membrane is lined with small trichocysts (Van Den Hoek et al. 1995). Apparent cell color can vary from blue-green, bright green, red, and brown depending on the relative abundance of chlorophylls, phycobilins, and xanthophylls. Photoabsorptive pigments within the one or two chloroplasts include chlorophylls a and c2, as well as phycocyanin and phycoerithrin related to but different from (Santore 1984) the phycobilins found in cyanobacteria, glaucophyceae, and rhodophyceae), and yellow pigments (α-carotene and xanthophylls. A wide variety of cell colors occurs as the mix of pigments varies considerably (Van Den Hoek et al. 1995). Another difference from the phycobilins of the cyanobacteria, glaucophyceae, and rhodophyceae is the lack of phycobilisomes. These protienaceous pigments are located on photosynthetic thylakoids (Santore 1984). Associated with the chloroplast(s) are bodies containing DNA specific to the chloroplasts, entirely separate from the nuclear DNA, and obtained from an ancestral cell by phagocytosis and conversion to a plastid (Santore 1984). There are no published reports of sexual reproduction in any of the Cryptophytes (Reynolds 1984). Phagotrophy in some species is enhanced by the presence of a gullet lined on the inside with explosive “trichocysts” (misnamed, as they are not cells but cell organelles) that discharge and uncoil a strip of material, that apparently assists their food-trapping system (Ibid.). Mixotrophy is the use of more than one nutritional mode, such as the combination of photosynthesis and phagotrophy. 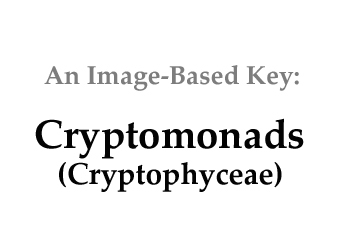 Ancestral cryptomonads are throught to have been phagotrophs, while many descendant species have lost capacity for this mode of nutrition (Kugrens and Lee 1990). Similar to the euglenoids, all cryptomonads are auxotrophs, requiring external sources of vitamin B12 and other vitamins (required by all cells for DNA and RNA replication). In general, organotrophy (incorporation of dissolved organic carbon) is another mode of nutrition for most members of these two groups (Graham and Wilcox 2000). Including freshwater and marine members, ~12 genera and 200 species are recognized, about half in each habitat. Freshwater species are widespread in temperate and high-latitude lakes, often forming relatively thin layers (plates) in the thermocline region well beneath the surface, at low temperature and light intensity, with a tolerance of H2S and a nitrogen requirement for NH3 (not NO2- or NO3-) or dissolved organics containing N (Graham and Wilcox 2000). Both starch grains, associated with a pyrenoid in the endobiont, and lipids in the cytoplasm of the host cell, varying with environmental conditions (Santore 1984). A rare autotrophic ciliate, Mesodinium rubrum, became secondarily photosynthetic by ingesting and hosting a cryptomonad. The ciliate thrives in brackish to marine habitats, sometimes causing red-colored tides, as do some dinoflagellates (Van Den Hoek et al. 1995). In the classic pelagic food chain the cryptomonads contribute considerable energy as they are both fast reproducers and rapidly consumed by zooplankton grazers -- high birth and death rates. As mixotrophs they also incorporate bacterial energy. Plankton of marine and freshwater habitats. Often form microstratified layers in the vertical density gradient of thermally stratified columns, and appear to photosynthesize efficiently at relatively low light intensity. Most genera are in the size range of 10 – 30 mm (nanoplankton) so are a preferred food of filter-feeding zooplankton. Cavalier-Smith, T. 1992. The number of symbiotic origins of organelles. BioSystems 28:91-106. Douglas, W.E., C.A. Muphy, D.F. Spencer, and M.W. Gray 1991. Molecular evidence that cryptomonad algae are evolutionary chimeras of two phylogenetically distince unicellular eukaryotes. Nature 350:148-151. Kugrens, P, and R.E. Lee 1990. Ultrastructural evidence for bacterial incorporation and mixotrophy in the photosynthetic cryptomonad Chroomonas pochmanni Huber-Pestalozzi (Cryptomonadida). J. Protozoology 37:263-267. McFadden, G.I., P.R. Gilson, and S.E. Douglas 1994. The photosynthetic endosymbiont in cryptomonad cells produces both chloroplast and cytoplasmic-type ribosomes. J. Cell Science 107:649-657. Reynolds, C.S. 1984. The Ecology of Phytoplankton. Cambridge University Press (387 pp). Santore, U.J. 1984. Some aspects of taxonomy in the Cryptophyceae. New Phytool. 98:627–646.